Gosh. What a painfully simple yet intense book. Death. UGH. 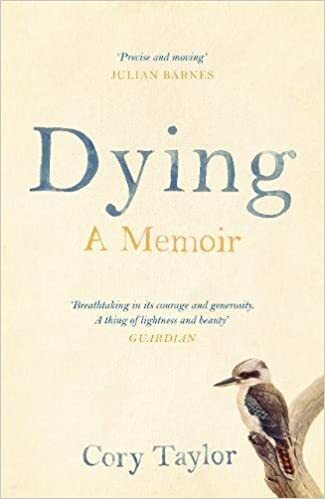 Written when the author was in the advanced stages of melanoma cancer, Dying is a memoir divided into three parts. The first is arguably lo más fuerte, with her reflections on the questions she most often gets re: dying (does she have a bucket list? Has she considered suicide? Has she discovered religion? Does she have regrets?). The first part examines her parents’ lives, and deaths. And the third focuses on the earliest memories of her childhood. At 150-odd pages, it is not very long, yet does a lot. I wanted to read this book as… a sort of self-help manual, maybe? Does that make sense? Does thinking about dying help us figure out how to live? It meant a lot to read that she found writing to be so valuable. As Cat Marnell said recently on le Twitter, your (creative) work is the only thing you have any control over! Yay for work! I also liked the parts where she quoted T.S. Eliot, and mused about the strangeness of time, of how life can be simultaneous, in the sense that she could be both a young girl and a dying woman at the same time (reminding me of this Mary Ruefle poem). Oh, it’s so hard to live meaningfully and attentively, isn’t it? The days I feel I’ve frittered away! Fritter, fritter, fritter. Hours and minutes wasted away like corn fritters, zucchini fritters… IDK what other kind of fritters there are for this senseless metaphor. What does a time fritter taste like? Can you hold time in your mouth? What does it feel like? Is it ever too late for any of us? Basically, this book made me feel sad but also moved. A necessary and powerful read.